Bokashi is Japanese for 'well fermented organic matter'. The organic residues are airtight fermented. The man who developed EM, Japanese Professor Teruo Higa sought in the 80s the appropriate "effective microorganisms" (EM) that were not harmful and secrete products that are useful and beneficial for other life forms. He found that traditionally making of compost took a lot of effort to maintain soil fertility. For centuries fermentation is used to preserve: white cabbage into sauerkraut, soy to soy sauce, milk into cheese, grapes into wine, etc. Or to improve taste, texture and digestibility as with bread..
Bokashi food exists for humans and animals. Which includes positive yeasts, fungi, bacteria, natural digested nutrients, vitamins and anti-oxidants, for example, for a healthy gastro-intestinal environment. You can also make Bokashi nutrition for plants. Composting is mainly an aerobic (needs and consumes oxygen) process in which CO2 is released. Soil organisms (among others: compost worms) process the waste. Regularly mingling to add oxygen is needed in order to keep the process going well. Fermentation is an anaerobic process. Because yeast cells pick up oxygen from the masses, the CO2 remains in it. You insert the Bokashi fermentation after two weeks in the soil where the anaerobic process is going on. Thus, there will be a lot of nitrogen back into the soil. And that's good for the soil life and everything on it. Bokashi making takes less time and / or labor. It should not be stirred and aired. In addition, there is no increase of temperature, and also no energy loss. Volume, carbon (C) and nitrogen (N) are retained, while in a composting process much N is removed from the heap. (Less CO2 emissions with Bokashi). In compost a high temperature is necessary in order to break down seeds and germs. In Bokashi this is done by fermentation and the acidity. Seeds are killed immediately or sprout first, after which they also die in the acidic environment. Bokashi is as long as it is airtight sealed, well and can be stored for months. 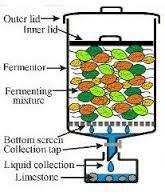 On a small scale, you can ferment almost odorless at home kitchen waste in buckets or special vats (no rotting). The box itself has an intermediate level whit holes, allowing the moisture with effective microorganisms (EM) to drip from the fermenting mass of fruit and vegetable waste. Cut organic waste into small pieces. Sprinkle some Bokashi on the (perforated, double) bottom of the kitchen bucket. Put a layer of 5cm fresh organic waste. Then again starter, waste, starter, etc. Push everything to expel air and oxygen. When the bucket is full you seal it tightly with a lid for 2 weeks. So you need a second bucket to bridge this period. Finished content of the bucket has a sour sweet smell. Drain daily the collected sap as plant food, otherwise it continues to ferment and may stink, because oxygen can’t reach it. Dilute with 100 parts of water. Every three or four months you need a bag Bokashi starter (about € 6 per bag of 2kg). Bokashi mix usually consists of wheat bran, inoculated with "effective microorganisms". Just like yeast in fresh or dried form that you can grow provided feeding it (sugar) and also multiply you can grow this mix yourself. Whether use it fresh from sap and not yet fully digested mass. On a larger scale, the system works like grass silage or maize. The mass must have the proper moisture content, about 50%. So fresh greens (leaf or grass) are just too wet, straw or shredded wood is too dry. Mixing is the solution. Strive for a good C / N ratio (carbon / nitrogen) of approximately 20: 1.Not for the fermentation process, but for the later use of Bokashi. Too high a C / N ratio can fix the soil nitrogen (temporarily), which is not desirable for plant growth and production. Here too, it is helpful to mix young grass, for example, (C / N of ± 10: 1) with some straw (C / N of 80: 1). Addition of seashells (lime) is useful in order to prevent the pH drops too fast, and the fermentation process already comes too early to a stop at a low acidity. The EM can you spray diluted with water on the heap. Remove as much air as possible out of the heap by drive over it with a heavy machine. Then cover it with a large piece of (agricultural) plastic that can be aggravated with tires or earth / sand. After 6 to 8 weeks you can use the Bokashi. Longer storage is no problem. A big advantage is that after the establishment of the Bokashi heap nothing more needs to be done. Volumes between a heap and a bucket can be fermented in a vat. A water seal may (as in wine making) close it from air to release and the produced gases. Benefits according to composting: anyone can apply it at home: local processing and use. Less gas and heat generated, less work and time, by reducing CO2 less polluting. More C, N and volume.